If you choose to walk on your path rather than follow that of others, you are a path maker. It means you are evolving rapidly into some one who can empower others. That’s exactly why Subroto Bagchi’s Zen Garden is a book you have to experience. Take the example of Dr. Devi Shetty, founder of Narayana Hrudayalaya, who was the eighth child among a brood of nine and came from difficult circumstances. He talks about how children from adversity and difficult circumstances prove to excel in any field of life as compared to those children who have everything on a platter. 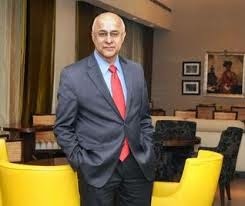 In his own words from Zen Garden by Subroto Bagchi, “The rules of the game are written, will be rewritten, by children with a deprived background. They need an opportunity. You just have to give them the language of communication with the society outside and they will change the way.” Yes, this strikes a personal chord because I hear my father say this all the time. Dr Devi Shetty, in Zen Garden, also cites Christiaan Barnard, a celebrated surgeon from South Africa. He is credited with conducting the world’s first heart transplant. He had rheumatoid arthritis in his young age and therefore, he had very crooked fingers. But he went forward in the field of surgery and created life-changing milestones in his life for the well being of others. Simply put, he didn't sit back and crib about his life or his crooked fingers. Instead, he SAVED lives. For a highly successful business man, his answers were mindblowing – because he says exactly the spiritual truths that the Rishis and spiritual masters have been repeating. Yet he isn’t simply repeating it. He believes in it and has had spiritual experiences that paved the way for him to emerge as a path maker in business too. Another inspiring chapter is the one pertaining to Kris Gopalakrishnan, CEO and MD of Infosys. When asked to say something for posterity, he strikes the iron hot by saying, “The position will automatically come. Do something useful.” Again, this is something that resonates deeply with me. I have heard my father say this and that has always inspired me. Aamir Khan’s tip on ‘inner healing’ is very significant at a personal level but you’ve got to read Zen Garden to appreciate and reflect on it. It would not be fair for me to reveal that here. The only segment in this book that disappointed me was one showcasing spiritual "leaders." The very expression 'spiritual leader' fills me with disappointment for one simple truth - there is nothing like that. It is incorrect. In the world of spirituality, I am a toddler still struggling to find my steps but the one thing I know for sure is that there are no leaders there. It's not a business hierarchy or a game. It is far more serious and one with 'spiritual' as well as karmic energies than one assumes. There are only MASTERS. They are MASTERS of the Highest Order. But then a business perspective of a CEO need not match mine, right? Yet a part of me wishes that the author, whose touch of perfection is most apparent when he writes, had got that simple but very important detail intact. 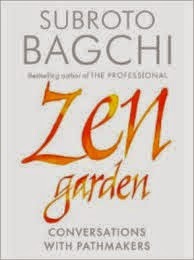 Hats off to Subroto Bagchi, the best selling author of The Professional and many other books, for writing Zen Garden. He is co-founder and chairman of Mindtree Ltd, a global IT solutions company. I had read his book The Professional several years ago and it had deeply influenced my work ethics. I lent it to team members I worked with. It's a different story that I never got the book back again because it went into a state of 'circulation' among team members. Needless to say, they were deeply inspired by his thoughts. When love is your signature and you are able to look beyond your pain in a constructive manner, the Universe finds ways to reward you manifold. Your actual awakening begins from there. The rest, as they say, becomes history. In fact, YOU create history. YOU CAN become the path maker. looks like a must read book from your review. I love autobiographies of achievers, especially those achievers who have been successful after going through hard times. I find all the lives of the people whom you have mentioned in your post inspiring. infact, most of them have their dream destinations on the Hosur road in Bangalore. I often tell about them to my children and point their offices. Will catch hold of this book, more so because of its spiritual leanings. Thank you for the review, swapna. It seems to be a great book.. Will try to get this book. Thanks for the review. Great review and insights here, Swapna. Many of the most successful people overcame difficult life situations or circumstances and made the best out of them. This books tries to show us that many of these people had similar patterns in their lives. And that if they succeeded with adversity and strength to really soar, we all can as well. Will look out for this book in the bookstores here and on my travels. I love the last quote about the universe rewarding you when looking at pain in a constructive manner. @Asha: Happy to know you liked this book review. I too love to read autobiographies of achievers and spiritual masters because they are so inspiring and full of positive energy. @Harish: Thanks for reading, glad to know you liked the review. @Ajith: Great to hear from you, thanks for reading and commenting. Happy to know that you liked the review and my quote at the end. Have you read other books of him?